This is a typical arrangement of signals at an intersection when there is a separate left-turn signal face provided for only left turns. The signal for protected turns will usually have a steady left-turn red arrow, a steady left-turn yellow-arrow and a steady left turn green arrow. New traffic signals head may also have a fourth signal; the flashing yellow arrow. Lights facing drivers proceeding straight ahead are often on a separate signal head and display circular lights. What Does a Green Arrow Appearing with a Red Traffic Light Mean? Vehicles facing the signal with a green arrow may go ahead into the intersection and may turn only in the direction indicated by the green arrow. Traffic going straight ahead or turning right will usually see a red light, since vehicles from the opposite direction may also face a green arrow and turn left. Watch for vehicles from opposite direction and make sure you don’t turn wide. While turning you the green arrow is supposed to protect you from oncoming traffic going straight ahead; they will face a red light. You must, however, yield the right-of-way to vehicles and pedestrians already in the intersection. Never enter the intersection if it is blocked. The green arrow does not give you the right-of-way. When the arrow changes to a steady yellow arrow, you should make a safe stop and wait for the next signal. Don’t try to beat a red light or a red arrow. A flashing yellow arrow has a special meaning. It means that you may turn in the direction of the arrow after yielding to pedestrians and other vehicles in or near the intersection. Oncoming traffic is not stopped by a red signal. Steady left-turn red arrows usually mean that all turns are prohibited. But laws aren’t the same in all states. Some states allow turning against a red arrow after stopping and yielding. Shared signal faces for both protected and permissive left turns are also common. At such an intersection you should expect green arrow and circular green being terminated at the same time. Instead of a red arrow, you may face a steady circular red light. The yellow arrow may also be replaced by a circular yellow light. It is important to be aware of the arrangement at any intersection. A protected turn only means that opposing traffic will face a red light and that pedestrians crossing the lane or lanes used by the protected left-turn movement will face a Don’t Walk signal. Note: A protected turn does not mean that all other traffic is stopped by a red light. If I have a protected left green arrow, is it safe to assume all other lights are red? The reason for my question is that I was making a left hand turn with a protected green arrow. It is a very busy intersection and often times people making left at that arrow are caught in the middle of that intersection – blocking oncoming traffic when the light turns red. Before entering the intersection I could tell there would be just enough space for me and the person behind me and neither of us would be blocking the intersection. As I was mostly through my left turn I saw a car on the opposite side of the street intending to make a right turn into my lane. Knowing if I let him in front of me, the car behind me would certainly be caught in the intersection, I did not let him in. I made it through to the other side but the car turning right was rather aggressive driver and was able to force his way between me and the car behind me and ended up bumping into my car. No damage, I didn’t take his insurance information. But I wanted to know if there was any chance he had a green light to turn right while we had a left green arrow. And if there was damage who would have been at fault? If you were “mostly through your left turn” when the driver in opposite direction started to make a right turn and forced his way in, the other driver violated the law. Note that unless local ordinances say otherwise, the other driver may turn right on red after yielding – he or she does not need a green light – but must yield. However, by not “letting the other driver in”, you could have contributed to the “accident”. An insurance company will often say that you both share some level of fault for such an accident. Split fault is common, since you both have a responsibility to yield in the intersection. But it’s a delicate call here. A good defense lawyer would have been my choice if it would have come to that. Oh, and if you have a green arrow, it means that opposing traffic that may cross your path has a red light. (technically not the same as all other lights are red). I was in Independence, Missouri at a large intersection, making a left turn from the left of two turn lanes with cars on my right in the other turn lane. I was about third in line, and the left turn arrow turned green. It was green when I entered the intersection, but the drivers ahead of me were so slow getting around the median, I was ticketed for not making my turn before the oncoming light turned green. I was in the middle of the intersection with other cars on my right in the same predicament, and I got the ticket!! A car even came after me, and the Cop went around him to give me the ticket. There was a slow-driving pickup truck ahead of me, blocking my way and a car behind me!! I was trapped into completing the turn. What do I do about the ticket?? In MO, many cities have local ordinances that prohibits a driver to enter an intersection knowing they will not be able to move or clear the intersection at all due to traffic backups ahead of them. So, if traffic was moving slowly and/or backed up, you shouldn’t have entered and blocked the intersection. At least that’s my two cents on why you got the ticket. If you want your day in court, check what the ticket says about the reason and seek advice. My question is about a green arrow that permits you to turn right. when you have a curb lane then the lane next to it can either go straight or turn. If the light is red then shows a green arrow’ is that for that particular lane or the curb lane? Let’s see if I understand you correctly. You are asking about the two outermost lanes, one curb lane and one through lane to the left of the curb lane. If right turns are permitted from both lanes (signs, pavement markings, or both, indicate if that is the case), than the traffic signals should have TWO faces, one for each lane. If only one face is provided for right-turn movements (possible, but I don’t think I have ever seen one), it applies to all lanes allowing right turns. left side turning on RED on his right side and cutting my line and we get in crash. Who has the right of it? No driver has the right of way. Both drivers have an obligation to yield under certain circumstances. See answer to Bernadette below! If you are asking who is at fault in a possible crash, the answer is: it depends. In my experience, insurance companies often lean towards shared fault. If signals show green arrow, yellow arrow, and then solid green (and when safe and clear): yes. Be aware, though, this is not always the sequence. After a solid yellow arrow, the next traffic signal light could be the green or red traffic signal light or the red arrow. With a red indication following the yellow arrow, you may be required to stop during the yellow phase, if you can stop safely. I came across a traffic light for left turn today which had a red dot (in the left) and a green arrow together. It changed to green arrow and green dot (in the right) while I was making the left turn. The intersection was clear and the vehicles on other sides were at full stop. What does red dot with left green arrow mean? Red circular signal (red dot) indicates that through traffic must stop and remain stopped. The green arrow allows left turns even when it appears together with the red signal. Many drivers are confused when these two signals appear together in a horizontal arrangement. It is often easier to understand the signals in a vertical arrangement. You should seek legal advice. I live in the state of Tennessee. I was making a left turn on the green arrow. Apparently it was the tail end of the green arrow. As I turned and assessed traffic the light went to yellow arrow to red arrow and to green and I was still finishing my turn. I got hit by a semi that I didn’t see in both scans I did of traffic before crossing 4 lanes. He was speeding. I saw the green light as I was coming out of the turn to straighten and in my scan all traffic was stopped so I went because I was in the middle of the road. Who is at fault. If you entered the intersection on green arrow and no other traffic was in the intersection when you entered, the driver entering the intersection after you with green light is most likely at fault. Code 55-8-110 about the steady green signal: “Vehicular traffic, including vehicles turning right or left, shall yield the right-of-way to other vehicles and to pedestrians lawfully within the intersection or an adjacent crosswalk at the time the signal is exhibited”. Hi Mark, I was making a left turn on a left green arrow signal with two cars in front of me. First car turned on left green arrow, second car turned on yellow arrow and by the time i entered the intersection the yellow arrow was gone but there was no red arrow either. But when i was at the intersection, there was only red round signal right not red arrow. I received a ticket for violation of signal. Can i contest this ticket? Am i at fault? I’m assuming this happened in Illinois. Illinois has a permissive yellow law: “Vehicular traffic facing a steady circular yellow or yellow arrow signal is thereby warned that the related green movement is being terminated or that a red indication will be exhibited immediately thereafter.” In Illinois, you may enter the intersection with the yellow arrow if you can continue through without blocking the intersection. However, you write “By the time I entered the intersection the yellow arrow was gone”, which means you most likely entered the intersection on a steady red signal (there is no delay between the two signals). Also, note that a yellow arrow is not necessarily followed by a red arrow – next signal may very well be a the red “ball”. You can always contest the ticket, but I wouldn’t get my hopes up on this one. Mark-I was flowing with traffic making a left turn on to a four lane highway through a green arrow. As I was getting ready to make my turn the car immediately in front of me stopped while the arrow was still green. I beeped, but the person did not move through the light. Traffic was stopped on all other sides, and I made sure that no one was making a right turn into the opposing lane, and I passed the stopped car by moving around their vehicle in the opposing lane while the arrow was still green. A police saw this and gave me a ticket for moving around the stopped car. I am tempted to challenge this. I believe that it was more of a hazard to have another car possibly plow into my backend, and decided to maneuver around the vehicle that was obstructing the flow of traffic since I was absolutely certain that it was safe. Does this sound reasonable? I think this means that you passed on the left side of the roadway 100 feet before or inside the intersection. Which is against the law in all states. You’re very good, Mark. I also saw this in the PA vehicle code (Title 75). Thanks for your response. I’m always a bit hesitant when turning as soon as receiving the green arrow because in my area sometimes the green arrow is given simultaneously with a green light on top. (I think this happens after peak hours in my area of Jersey) I have no way of knowing what the other side looks like directly but in my mind there’s a chance that they were given the exact same signal, which means the left lane will try to make a left but the right lane is still given permission to turn right or go straight. 2) If only a green arrow was given to either left lane but the light is still red, do I have to yield to cars making a right turn on red from the other side of the intersection? I can’t very well turn into the next street if there’s a car already there but who has the right-of-way there? 1. No, by law, you did NOT do anything wrong. 2. See answer to Bernadette 02/26 2017 below. When a circular green light and a green arrow is displayed at the same time, traffic from this direction may turn left or right, or go straight. The arrow indicates a protected left turn. Traffic from opposite direction has a red light. Traffic from opposite direction may not proceed straight or turn left. Vehicles preparing a right turn must stop and proceed only if the way is clear. At an intersection with lights, let’s say car A is turning left and has a green circle light while turning onto a two lane road. Car B is coming the opposite way and turning right on that same road with a green light as well. Can both cars go at the same time since it is a two lane road, or does car A have to wait? If there are solid green light signals in both directions, left turning vehicles must yield to oncoming traffic. The typical state law says something like this: “The driver of a vehicle intending to turn to the left shall yield the right of way to any vehicle approaching from the opposite direction which is so close as to constitute an immediate hazard”. If you are turning left, be prepared to yield and give room the other vehicle in case it makes a wide turn and enters your lane. Here’s the scenario: I’m making a U-turn on a green arrow but at the same time the cross traffic has a right turn green arrow so both vehicles end up going in the same direction on green. The turning radius makes it difficult to stay in the left lane after the U-turn is completed. When making a U-turn on a green arrow, I generally assume any other conflicting traffic will/should have a red light to prevent accidents. If I have completed my U-turn and the vehicle turning right hits me are they at fault since they entered the intersection last. From their point of view they had a green light so no other vehicles should be in their way. Or does a U-turn always yield regardless of circumstance (although there is no way to see that they also have a green light). I guess you can play it safe and come to a complete stop if you see another car coming up to the signal to make a right turn and assume they MIGHT have a green light – but this may cause further accidents if the car behind is also making a U-turn and is not expecting you to suddenly stop. There are no signs for U-turns not being allowed, and U-turns are fairly common in the area because of median strips dividing traffic. At some other intersections where the right turn green arrow does NOT exist (they can turn right on red), they even go so far as to post signs warning they must yield to those making U-turns. I personally think that the scenario of conflicting traffic patterns both having a green light should be unlawful. What is your take on this situation. Thanks! I think you should make sure of two things: 1) is a U-turn permitted in your scenario – this is not automatic 2) does cross traffic really have a green arrow for right turns. If yes to both, I would contact local authorities and get their opinions. Two green arrows here – even if not unlawful – doesn’t sound like a great idea. But generally, if U-turns are permitted, you are required to make sure such a turn can be made safely. Which means you are required to stop and yield to vehicles legally entering the intersection before you. This also means that a “wide” U-turn could be considered unsafe, should it result in an accident. This applies regardless if cross traffic turns on green arrow or red light. My take is to always play it safe. Slow down to a low speed well ahead of the U-turn to let others know you’re not just turning left. Stop if necessary and position your vehicle so that cross traffic also understands your intentions. I’m not getting the clarification I need from your explanation. If two people arrive relatively at the same time at a light, who has the right of way, left turn green arrow, or the oncoming right turn on red? No-one has the right-of-way. Question is who must yield. The driver with a red light must stop and yield to all vehicles lawfully entering the intersection and may only make a lawful turn when the way is clear. A typical law in U.S. says that this driver must yield to “any vehicle that has approached or is approaching so closely as to constitute an immediate hazard to the driver”. The driver with a green arrow must yield to vehicles that has lawfully entered the intersection before lights changed. In other words: the driver turning right and facing a red signal must stop and yield. The driver facing green arrow should go first, unless both drivers can safely enter the crossroad without crossing each others path (a no-hazard situation). My incident took place in Utah. I had the green arrow to turn left at an intersection but this lady driving the opposite direction took the red light and we hit. I got a ticket for not yielding. Was i really at fault ? It probably boils down to if you can prove that she ran a red light or not. If you can, consult a lawyer – depending on how much money is involved. But again, a motorist making a left turn always has the duty to make sure that the way is clear and that oncoming traffic has stopped. A green arrow does not give you the right-of-way. In most cases, you are likely to be – at least – partly at fault. Today, I was making a left turn (I had a green arrow), and this huge 18-wheeler truck on the opposite side was going straight. I had already started turning, and this truck was not stopping, even though my car was obviously much smaller than the truck and he was going too fast. His side should have been a red light, as I am positive that I had a green arrow, so he should have been driving much slower since his truck was far larger than my car anyways. I was so scared, luckily he hit his brakes and I was able to get through right in time, but I really could have gotten killed, and he should not been going. Let’s be thankful for the positive outcome of this incident! I think one of the big problems in a situation like this is that many drivers don’t respect the yellow signal. If a driver comes to a safe stop when the yellow signal is displayed (which is required by law in most states), they don’t risk running the red light. Which I think we can assume the trucker was. But as I have said before on this page, before making a left turn with the green arrow, you must always make sure that the way is clear and that oncoming traffic has stopped. Hi, i was turning left on a green arrow that was pointing (up) not to the left, is that a yield light or thats a protected left? If you are in a lane with a straight-through green arrow (arrow pointing up), you are NOT allowed to turn. A green arrow indicates the ONLY direction in which you are allowed to travel. A straight-through green arrow is often used when intersecting a one-way street to discourage wrong-way turns. But i was in the left lane that said turn left only . There should not have been a green arrow pointing up in a left-turn only lane. If you are sure you were in a lane for left-turns only, my guess is that there was something wrong with the traffic light. I have a question, when I was on the left lane , the left arrow turned red , but the other light was green to go straight. I changed lanes to the right side and the camera lights flashed. Did I do something wrong ? Proceeding against the red light: I assume that a left turn against a red arrow is not allowed in your state (most common). In such a case, you may have violated the law if you entered the intersection when changing lanes (passed a stop line or crosswalk). This may have triggered the red-light camera. Crossing a double white line: You may also have violated the law if there was a double white line between lanes (this is, however, not very common at intersections). If there was a single white line (common), changing lanes is discouraged. It will usually not result in a ticket, unless you interfered with traffic. This lane is only going left, and when the light is green and with a green arrow, the oncoming traffic cannot go straight or right at all. I need some advice on how to fight this ticket. I didnt do anything wrong, and when I took both my defensive driving course, i askes the driving instructor the same questiom and they only told me i had to use my signal when turning into the turning lane. You asked “What law states you must use your signal when in an only turning lane”. In New York (which I assume is your state) the answer is article 28 P. 1163. Did you do anything wrong? Yes, unfortunately you did. Even if the exact wording of the law differs slightly between states, you must signal before turning, even if you are in a turn lane. Not doing so is not only illegal, but also inconsiderate. Does that rule apple in Virginia too? Basically, yes. Virginia law requires the use of turn signals “whenever the operation of any other vehicle may be affected by such movement”. This wording is often debated and sometimes used by drivers as an argument NOT to signal, which is why the phrase has been replaced in other states to make the law less ambiguous. It is best to get in the habit of signaling your turns at all times. It helps everyone understand your intentions. ok i seen these officers a week ago fishing for plates and 3 days ago this happen its 1 in the morning and just got out work going home i turned into the turn the protected left turn i that only fit 3 cart, i seen and pass the same officers a quarter mile i see them flying to me and cut my wife off amost hitting her and me from behind so i moved forward a little then the light turn green and made that left and 3 sec later the pull me over in front of my house for not signaling the left turn, they didnt ask if i was drinking and herd the officer say he smell like gum and the other officer seen a empty glass cup in my back sit the sobriety test me 6 of them i know i pass then did a drug sobriety test pass that then was ask to so a breath test i refused cuz i know i pass them and ask if i can go but they arrested me.was at the station didnt do a blood test and they lied to the magistrate i failed the 5 sobriaty test and witness i pass themmy wife. ticketed for dui/dwi 3rd and refused test 3 off and improper 0r unsafe changed lane. and his code was 46.2.848? something was not right right? You had a police vehicle directly behind you. The police vehicle may be affected by your movements. This means you must signal. After the sobriety test you refused a breath test. Then it’s the officer’s word against yours. You will not be offered a second chance to take the test. Should the court have ruled differently? I don’t see how or why. Sorry. I may have a tough one. In California there is a temporary signal light set up for approximately one year. The temporary lights are partially in the roadway, blocking the bike lanes on a four way intersection. North and South bound traffic have medians and protected left turns that transition into permissive. The question(s): With the reduced space to make a U-turn and the possibility of oncoming traffic, should No U-Turn signs be installed? What is the required amount of space to make a U-Turn? If signal lights were working as they should: no, she couldn’t have. If there are any discussions about who is at fault in this situation, you should definitely contact a lawyer. You entered the intersection “waiting” for the green arrow? Which sounds like you entered with a green signal and then stopped in the intersection? If the oncoming vehicle faced a yellow light and could not stop safely, it sounds like you are (with your stopped position in the intersection) at least partly to blame for the accident. An insurance company will probably argue negligence on part of both drivers (split fault). If there were injuries, you should contact a lawyer. I have situation in Texas where I have a protected left turn and the incoming traffic has a constant right turn. What is the law? I’ve almost been run over many times. If I do get run over in a protected left turn do I have a foot to stand on by law? Not sure what you mean with “constant right turn”. If it is a constant right turn signal (vehicle’s signal lamp), it does not change any of the below. You – the driver facing the green arrow – may proceed after yielding “the right-of-way to a pedestrian lawfully in an adjacent crosswalk and other traffic lawfully using the intersection”. The other driver – facing a red signal – may turn right after stopping and standing “until the intersection may be entered safely, and yielding right-of-way to pedestrians lawfully in an adjacent crosswalk and other traffic lawfully using the intersection”. In other words, both drivers have the responsibility to yield to vehicles “lawfully using the intersection”. If you are hit by a right-turning vehicle from the other direction, you have most likely already completed your left turn and should have a good case in court. I’m a driver in California. Situation is this: I am making a protected left-turn (the signal never allows for an unprotected turn) onto a freeway on-ramp and on-ramp has only one lane. There is a vehicle coming from the opposite direction that wants to turn right onto the same on ramp and they have a ‘turn only’ lane that merges into the lane that I will end up in after I complete my turn. Having just learned that protected left turns do not automatically have right of way, which vehicle should yield? I always thought that the vehicles turning right would need to yield to those with the protected turn, but I find a majority of drivers play a game of chicken and just go assuming the left turn vehicles have to let them in. If the left turn is controlled by a green arrow, the oncoming vehicle should be stopped by a red signal. After stopping, the oncoming vehicle may turn right only after yielding and only when it is safe to do so (unfortunately, the “only” here is often ignored by drivers turning right against a red signal). If the oncoming vehicle has started to turn before the red light came on and is still in the intersection, the vehicle turning left should yield. I lives in NYC. I was waiting for the the left green signal arrow to be on , I had like 5 cars in from of me waiting for the same, when it was “ON” unfortunately i was the last car when the left turn signal arrow turn in yellow then just in a circular green light for the two lanes right next to me and for the oncoming traffic I was already in the intersection yes with my left turn signals waiting for the way to be clear with no cars coming or pedestrian on my way to do so. I did not realize that it was a cop on the other side of the street waiting for me to do so, he pulled me over and put me a ticket. There’s NOT any kind of signs saying “wait for green light” or “no turn on red” or saying otherwise ANY. So, this got nothing to do with “the green arrow”, it applies to any green (or flashing yellow) signal. Before proceeding you must make sure you “yield the right of way to other traffic lawfully within the intersection”. Which basically means, you must stop and wait BEFORE you enter the intersection. Since blocked intersections is a problem in big cities in NYC, I am not surprised that an officer was just waiting for this to happen. You are less likely to get a ticket elsewhere, simply because blocked intersections are less of a problem. Hey Mark, i hope your still active on this blog. My question is not so much conserning the left turn but a right turn. I am generally adamant on using my turn signals. I can not say 100 percent that I did not have my blinker on, but the officer that pulled me over claimed i did not. My question is this, in the state of Texas is it unlawful to make a right turn in a right turn only lane on a green light with zero cars around you. My concern is over the corruption of some police officers with all that is going on lately. I searched the state driver’s hand book and the web as well but can not find an answer that meets this exact criteria. I’m not looking to break any laws. I have never had a traffic ticket in all of my 35 plus years of driving. I am only looking for what the law states, not an excuse not to use my turn signal. Is it unlawful in Texas to make a right turn without signaling? Simple answer: yes, it is. The law differs slightly between states. In some states you could get away without signaling, since the law require such turn signal to be used “in the event any other vehicle may be affected by the movement”. Other states have re-written their statutes to make sure signaling is required at all times. In Texas, the law is very clear: “An operator intending to turn a vehicle right or left shall signal continuously for not less than the last 100 feet of movement of the vehicle before the turn.” (545.104). There are no exceptions. Mark, thank you so much for your quick response to my question. I feel much better now that I have a direct answer from a knowledgeable third party. I have learned something new today and can feel confident knowing what the law states rather than having to face the consequences of hearing ignorance is no exception to the law. Just have to be more hyper aware to always use my turn signals. Thank you again very much for your help. Hi. If you are turning right and you have a right turn only lane with a yield sign (light is green) and (in tx) and the oncoming traffic light is green with a left turn that has a green arrow but is not green–is instead left turn when clear when there’s a green (circular) light, who has the right of way? The person turning right or the person turning left? Thanks. I am not sure I understand your description, but I will give it a try. Approaching traffic (turning left) will only face a green arrow when this turn is not in conflict with other vehicles moving on a green or yellow signal (that is why it is called a protected turn). A right turn from the other direction can only be made against a red light. Before turning right against such a red light, this driver must yield to the vehicle turning left with the green arrow. If a driver turning right faces a green arrow indicating that only a right turn is possible, traffic from the approach will not at the same time face a green arrow if there is a risk of conflict. If traffic from the approach has a circular green light in this situation, traffic lanes should be separated in a way to avoid conflicts and/or there may be signs to indicate that traffic from the approach must “yield to right turn”. Remember, there are no yield signs at intersections with traffic signals and no driver has “the right-of-way”. Any of the drivers in this example must always yield to any motorist or pedestrian that has lawfully entered the intersection. This has happened to me a few times. I am stopped in the left turn lane waiting for the green left turn arrow. The arrow turns green and I proceed to make my left turn and want to get into the right lane of a two lane road (both lanes going in the same direction). Then before I can clear the intersection and get into the right lane a driver from the other side of the intersection makes a right turn on red and almost collides with me. It was my understanding that in Pennsylvania before you can make a right turn on red that you must yield to all on coming traffic (pedestrian and vehicular). What’s your call on this situation ? Remember, a green arrow does not give you the right-of-way. Chances are that you would be at fault because of swinging wide into the wrong lane or because an incorrect lane change. Pay attention to any pavement markings in the intersection guiding you. If an accident should happen, always consult with a lawyer. I live in New Mexico and I was at an intersection where there was a light with a LEFT TURN green arrow (protected turn from oncoming traffic). By the time I got to the intersection, the Green Arrow was gone, but there was a solid green light in both the traffic light for the left turn and for the right two lanes of traffic going straight or turning RIGHT. I turned when it was all clear of oncoming traffic and was pulled over by a police officer and given a ticket. I went to court and the judge said I was wrong to have turned LEFT on the solid green. I do this ALL OVER Santa Fe and have never been stopped at any other intersection. Wasn’t the judge wrong as well as the police officer? On Broadway/138 in Fall River, MA, there are two consecutive intersections which turn on simultaneously a left turn green arrow, and a green light for traffic coming in the opposite direction, with no additional signage. In one of your replies above you assert that a green left arrow always has an opposing red light for oncoming traffic. This is certainly not the case for the two intersections I have observed. Is there a traffic regulation I may refer to if I were to report this to the department of transportation in the state of MA? According to the National Manual on Uniform Traffic Control Devices (MUTCD), a left-turn green arrow signal can only be used to allow a protected left-turn movement. The MUTCD (Section 4D.17 Signal Indications for Left-Turn Movements – General) states: “During a protected left-turn movement, the signal faces for through traffic on the opposing approach shall simultaneously display steady CIRCULAR RED signal indications.” Massachusetts has no amendment to this part. Signals with green arrows simultaneously allowing protected left turns from both directions (not through traffic) are common and within the idea of a protected turn, since turning vehicles will not cross paths. who will be at fault, if a driver was making permitted left turn at green arrow and hits the pedestrian who was crossing the road at red light and pedestrian crossing sign was showing hand signal. Probably not a clear-cut. A court would look at all circumstances involved; visibility, speed, traffic, order of events, mental and physical condition of the pedestrian etc. Meaning, both have duties and responsibilities in this situation. If the pedestrian knowingly and willfully disregarded the control signal and interjected himself or herself into this situation, he or she is most likely at fault. Alternately, if the pedestrian was already in the intersection and the driver did not exercise due care, he or she is most likely at fault. I was at an intersection with 2 lanes going straight and a third lane for making left turns. I was in the left turn lane.. There were 2 lanes coming from the opposite direction. The person driving me insisted that he did not have to wait for the green arrow in order to turn left. He said he could turn as soon as it looked safe as long as the circular light was green. So he floored it and turned while cars were approaching. Is what he did illegal (in Massachusetts?) If you could turn as soon as you thought it was safe, there would be no point in having green arrows.. And I think that perhaps the arrow is also protecting pedestrians who might get a walk signal and not expect you to be turning. In short: yes, it is legal. The green arrow indicates a “protected turn”. It is often used at intersections where it is (due to traffic from the other direction) difficult to turn during a circular green phase. Your situation is not at all uncommon. A turn lane may have one phase where it is controlled by the green arrow and one where it is controlled the circular green light. Unless there is a sign “left turn on green arrow only”, you may turn during both phases as long as you yield to vehicles in the intersection or vehicles close enough to be a hazard. You must also yield to pedestrians in crosswalks. Thanks! In the meantime, I’ve been doing some research. So far, the women say you can turn ONLY when the arrow is green, and the men say you can ALWAYS turn left if the circular light is green. And no one mentioned that there could be a sign requiring you to wait for the arrow! But I’ll have to return to that intersection to see if there was such a sign before I can win the argument with my friend! I was on my lane to turn left with a yellow arrow together with circular red, I made the turn when it was only circular red because I knew next was green and I could not stop safely when the yelolow stopped. That circular red was on to protect my turning,so I did it. Was I correct? In most states, you must come to a safe stop when a steady yellow arrow is displayed. You may only proceed against a yellow signal, if you cannot stop safely. This, however, only applies as long as the traffic light shows a yellow signal. In no situation are you allowed to turn if there is a circular red signal and no other signal (or officer) that permits the turn. Today, when I was waiting in a left lane to prepare to make a U turn, It was a red light. Then the traffic light turned on green arrow while the red light was still on in front of my lane, so I made a U-turn. Was that right? I was so confused when both of the lights which were in the same column turned on at the same time. I live in Texas. If there is a sign that say right on green arrow only does that mean you can not make a right on a red arrow? It is so confusing because typically you can make a right on red as long as you yield to oncoming traffic, check for predistrians, and make sure there are no signs that state no turn on red. In Georgia they have the signs that say right on green arrow only. If you have two lanes turning to the right the one furthest to the right should be able to turn right on red arrow, right? Most cars just honk their horns if you stop. It really is confusing! Help me to understand please. If there is a sign saying left (or right) on green arrow only, it means exactly that. You may only turn if the green arrow is lit. In texas, i have the sign below the light, it says to yield when green with a green circle. I had cars in front of me and behind me, The light turned green, WITH A GREEN ARROW, so i made a protected left turn, i nearly completed my turn about 95% done, and a car who claims she was going straight, although i think she was turning right, she hit my vehicle on the side near the front passengers tire and window seat. If i had the green arrow, doesn’t that mean she entered traffic without looking? I had received a ticket for not yielding.. although all the cars on her side of the road came to a stop for a while, and thats when i had my green arrow, i proceeded to make my protected turn, & so did the cars in front of me, why is it that i received the ticket for failing to yield if i had the right of way? also, she apologized to me and told me that she was confused and that she couldve sworn the light was green although the cars next to her were at a complete stop. whether you’re going straight or turning right when you have the green arrow to make a left turn their light should’ve been red which is what i believe since the other cars were at a stop, do i have a chance to win if i take this to court? An officer obviously thought you were at fault, since you got the ticket. Remember this, Texas law does not give anyone the right-of-way. The law only says who must yield. When turning left a green arrow signal, you must always yield to any vehicle lawfully using the intersection. Consult a lawyer if you think that the other driver entered the intersection unlawfully. Hey mark ….when turning left at a circular green light .we must yield the right of way to traffic approaching in opposite direction? In Texas, when you are in a left hand turn lane and the green arrow is showing for you to go. And you proceed to make the turn and during your turn the yellow arrow comes on for 3 seconds. then immediately turns red as you are in front of the third lane closes to the curb. If someone hits you because they now have a green light whose fault is it. The outcome in court and/or by your insurance company depends on a lot of things. Meaning, it is not easy to answer questions like this without all details. If you lawfully entered the intersection on the green arrow and are hit in the intersection by a vehicle previously stopped by a red light and now proceeding on green, the other vehicle is most likely at fault (the other vehicle must yield and may only enter the intersection if it is clear). However, if the left-most lane going in your direction (the lane closest to the center) is available and you turn into another lane (the right-hand lane) and this is the reason for the crash, you may be at fault. Texas law states that you must turn “so as to arrive in a lane lawfully available to traffic moving in” your direction. It is usually argued that you must turn into the closest lane, if you turned into the “wrong” lane you may have contributed to the crash. If this is something that happened to you, you probably want to consult a lawyer. I was visiting Savannah Ga. and on King George Blvd. wanting to turn left onto Hwy 95 S. The light was green and the arrow was green….there was also a sign that I did not read because I had the green arrow. I proceeded to turn left and saw that the traffic was not stopping….the huge truck stopped but the car next to him hit my bumper and side panel. I got a ticket for not yielding the right of way. That is what the sign was for. Isn’t this extremely dangerous having a green arrow and green light and the oncoming traffic also having a green light? I will pay the $217 for the ticket, but I think it is unfair and am concerned for future people who are not from the area and don’t have such signals in their states. The green arrow means that oncoming traffic is stopped by a red light. Always. The sign you saw probably said “yield on green”, which refers to the solid circular green signal when shown alone – not the green arrow. Basically, either the oncoming car was running a red light or you didn’t have a green arrow. If the green arrow is not lit, you must yield. And this is probably what you got the ticket for. A third option, of course, even if it is unlikely, is that the traffic lights didn’t work properly. I have always wondered about how to handle two similar scenarios. Three lanes heading the same way. Lane on the far left is for turns. Other two for straight ahead or right turn. All three have red light. Left turn lane has “Left turn on green arrow only” sign. Two right lane lights turn green. Obviously left turn lane must wait for green arrow however, what if there is no sign? Can the left turn be made (yielding to oncoming traffic) if the turn lane remains red but the two right lanes are green? It would appear the answer is yes otherwise why would there be the need for a sign if the left turn lane always had to wait for the green arrow? In your scenario the left turn lane will be controlled by either the same circular light that applies to the other lanes (green) OR a separate arrow. If the arrow is red, rules are different in different States. In some States turning against a red arrow is always prohibited. Most States, however, allow a left turn against the red arrow if you are turning from a one-way road into a one-way road (unless posted otherwise). A few States allow the turn from any street into a one-way street (unless there is a sign telling you otherwise). Many States have introduced the flashing yellow arrow for this particular situation. It means you are allowed to turn after yielding to oncoming traffic (unprotected turn). This happens to me a few times, I am on the left lane w the protected turn. Like the article above. The road I am about to turn to have 2 lanes. Am I only allowed to the left lane of that 2 lanes? Or I can pick any lane as soon as I have the green arrow? 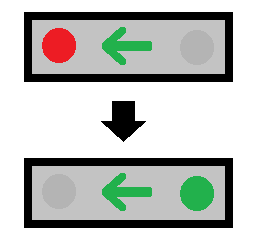 Some close encounter I had is when the oncoming traffic are also red, but they turn right when they look left and traffic is clear, but they didn’t see me in front turning my left (green arrow) and they turn right the same time. This could be avoided if when I turn left, I chose the left lane, but there are times when after i turn left I need to exit the road asap. (Gas station, grocery entrance, right lane will connect to freeway,etc. thus, by instinct I turn left and enter the right lane. Laws differ between States. Some will consider it a violation to complete the turn in a right-hand lane. In general, you should always complete the turn in the lane closest to the center on a two-way road. When necessary to change lane, you should do that after completing the turn and only when safe. As your experience already indicates, you must make sure that other vehicles are aware of your intentions before entering the right-hand lane. If you’re on the center lane and the left green arrow is on, does that mean that the person to your far right (lane nearest to the curb) can’t make a right turn? Also, is that individual allowed to make a right once all vehicles making a left on a green arrow have completed their turn? A person in the far right lane must come to a stop. He or she may turn right when the way is clear – unless there is a “No Turn on Red” sign posted. Exception: In some places local ordinances may prohibit ALL right turns against red – like in New York City. What are we gonna do with steady red light? Once I thought is simply to stop because it is a stop sign. You got a personal answer, since you also reported this from one of our questions. A stop sign and a steady red light are not the same thing. A stop sign means you must come to complete stop, yield, and then go when the way is clear. A steady red light means you must come to a stop and wait for a green light – except where turning is allowed after the stop. Got it ! Thank you Mark. Do you have to use tour blinkers in this scenario.. When turning? Yes, you should always use your turn signal! Even if the law in some states just require a signal “in the event any other vehicle may be affected by your movement”, it is a really bad habit not to use your turn signal just because you don’t see anyone else around. When you face a green arrow in your lane, you must yield to traffic already in the intersection and then turn in the direction of the arrow. A green arrow means that oncoming traffic (that might cross your path) is stopped by a red light. Your turn is “protected” by this red light. I does not say anything about traffic from other directions. It is a common mistake to think that ALL other traffic is stopped by a red light. i have a little trouble understanding this. can someone please break this down for me?